Anyone who knows my girlfriend Suz would conclude that she doesn't look like the killer type. 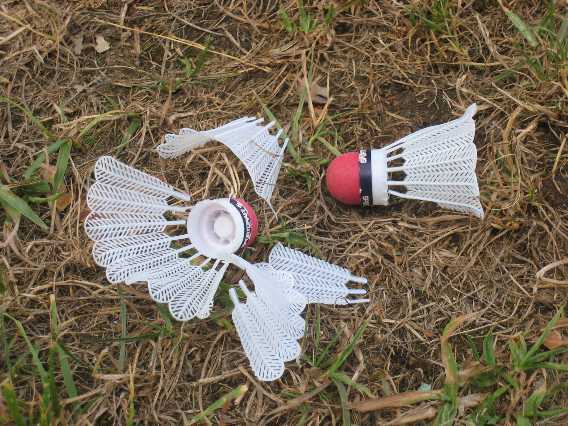 But one little game of badmitton and look what she did to the birdies! Now I'm all for finding good healthy activities in which to take your frustrations out there Suz, but wow; apparently things are stressful at 'ol Hugs and Kisses because these birdies didn't stand a chance against you!!! Imagine what she'd do with kick boxing!!! There's always another surprise to be had around the corner with Susan. One of her many charms. Hey now, I don't get all the credit for killing the birdies! That dog helped (and no, it wasn't Rufus).